Since the Marcos Dictatorship 34+ years hence, the present Gloria Arroyo government continues to use the public educational system/institution to destroy our homeland as a sovereign nation (frankly, was it ever once?) by ignoring and belittling nationalism, drastically cutting funds and minimizing liberal education, i.e. the study of history, the humanities and other social sciences which broadens the mind and develops social analysis and critical thinking. In lieu, the succeeding administrations have gladly kowtowed, rather than fought, the "educational" templates the IMF and WB have presented to them to promote "instructions" [the more appropriate term than education] for building primarily a cheap mass of technicians who are/will be available to local affiliates of transnational corporations(TNCs). The low wages prevent most, if not all, of these technicians to have more formal or informal education that could develop and help them learn "how to think" beyond their technical training and beyond their day-to-day struggles for themselves and their children. Thus their inadequate education will result in their dumbing down and not allow them to comprehend their individual and the homeland's socioeconomic-political predicament. etc. and of course the PMA. In these American and/or Americanized military schools, where as young, select and promising Filipino military officers -knowingly or unknowingly- American interests are drilled into them as identical to Filipino interests or that American ways will work for us. From 1950 to 1990, about 20,000 Filipinos reportedly went through these programs; and these training programs continue. 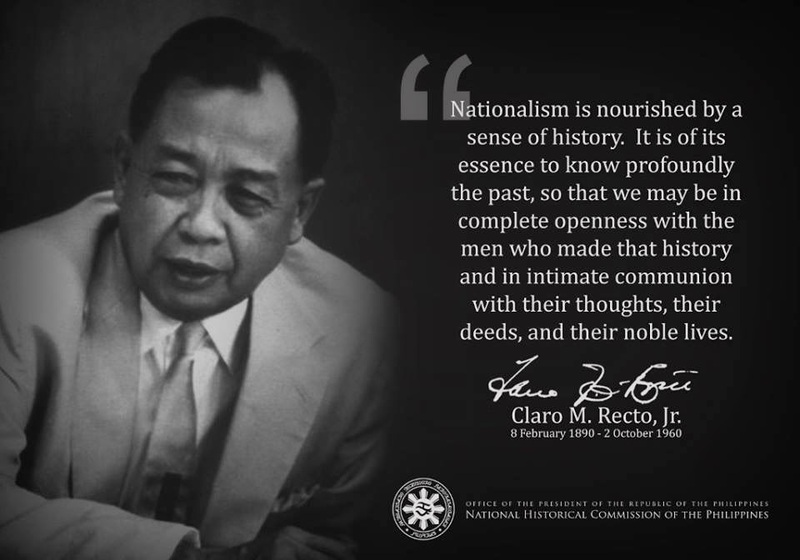 Therefore in our midst we have a continuous supply of fellow Filipinos who have been reinforced in the beliefs that "what is good for America is good for the Philippines." Throw in the estimated 40,000 Filipinos recruited by the US Navy from 1947 to 1990. Throw in our ever-present and dominant naïve and sentimental outlook. Most, if not all, of them --having taken American citizenship or not-- think and behave oftentimes more American than American citizens (in the US mainland) in terms of militarized narrow-mindedness. They frequently appear to be trying really hard to show their gratitude and patriotism to America, as if patriotism is supposed to be unquestioning and blind loyalty, without honest dissent -- demonstrating the lack of understanding for true patriotism and real democracy (very unAmerican!!). Therefore, their militarized conditioning has led to a strongly pro-American AFP leadership and rank-and-file (bordering on being unFilipino at times). With extremely rare exceptions, such as the late Capt. Rene Jarque, these soldiers/ex-soldiers tend to equate expressions of Filipino nationalism, or Muslim struggle for separatism, as either communist or "terrorist," the latter per the current US-foreign policy spin. And thus since 1972, regardless of who sits in Malacanang, we have been witnessing an endless program of intimidations, disappearances and assassinations of political activists, journalists, clerics, peasants and urban workers. Many of the ordinary unarmed and ignorant Filipino-in-the-Philippines live, more aptly, simply exist; while being misled by our so-called educated Filipinos and being terrorized by a significant number of murderously, unconscionable and close-minded military and paramilitary units. And so it goes endlessly, with the church merely "consoling" the common tao and reinforcing their ancestral conditioning that it is their fate, "iginuhit ng tadhana", "may awa ang diyos" - to suffer, to think like children "unless you change and become like children," to be humble and meek like the herd of sheeps- so as to earn their great reward in the heavenly afterlife. Indeed, our Christian religion in the homeland still validates Karl Marx's charge almost two centuries ago:" it (religion) is the opium of the people." Alleluja! Compared to all other state universities and colleges (SCUs), the Philippine Military Academy (PMA) remains the learning institution most favored by government. Along with the Department of Education (DepEd), the SCUs have their new budgets slashed several-fold. The PMA, as expected, has no budget cut; its allocation has in fact been increased – from P557.92 million last year to P568.17 million this year. In the proposed budget, the PMA cadet is subsidized with P12 million for a four-year course or roughly P8,219 a day; his counterpart at the state Polytechnic University of the Philippines (PUP) has a measly P43 a day or only 0.52 percent of the PMA cadet’s daily subsidy. The PMA produces the country’s military elite but its professional hierarchy in the armed forces has been wracked by graft scandals, mutinous tendencies and human rights violations. This has not deterred the current presidency – and its predecessors – from showering both the military and national police with fat salary increases and other high budget allocations, however. Speaking at a rally of about 1,000 students in Mendiola, Manila on Feb. 14, Rizza Ramirez, national president of the National Union of Students of the Philippines (NUSP), asked: “Is this government more interested in producing corrupt military officials than professionals and teachers much needed by the country? While this government spends huge amounts of money in launching its war in Mindanao, the Filipino students suffer from dilapidated facilities, tuition and miscellaneous fee hikes and low quality of education. ”The Valentine’s Day rally, joined by students from SCUs and public high schools, called President Gloria Macapagal-Arroyo a “heartless mother.” The state scholars and other rallyers lambasted the Macapagal-Arroyo government for cutting education expenditures mercilessly in favor of debt servicing and military expenditures. In the proposed national budget for this year, 33.6 percent goes to interest payments amounting to P301.69 billion, Ramirez said. The combined allocation for debt servicing, including the payment for the principal debt, accounts for more than 70 percent of the national budget. The country has now incurred a $60 billion foreign debt.Moreover, P1.2 billion will be allotted for intelligence funds this year. The Office of the President will get P650 million. The intelligence fund earmarked for the Philippine National Police (PNP) is P270 million; Department of National Defense (DND), P111.5 million; and National Intelligence Coordinating Agency (NICA), P31.24 million. The budget of the DND this year amounts to P43.6 billion. The Department of the Interior and Local Government (DILG) will get P46.04 billion.Anti-VAT, too. Ramirez, a college senior from the University of the Philippines (UP), also opposed the imposition of a hike on the Value-Added Tax (VAT) saying taxes do not translate to social services such as education, health and housing. “Isn’t it appalling for Ms. Macapagal-Arroyo to tax anew the poor majority so as not to default on debt payments? The Filipino youth and the people in general do not get their fair share in the nation’s wealth. The national budget for this year reveals so much about her real priorities,” the NUSP president said. Overall, education spending remains a pittance compared to debt servicing and military expenditures. For the first time, the Department of Education (DepEd) will suffer a budget slash of P4.6 billion from last year’s allocation. The reduction is expected to even aggravate the public education crisis in terms of shortages in classrooms, desks, textbooks and teachers. SCUs will have to do with P950 million less than the previous allocation. The UP budget will bear the biggest slash amounting to P355.64 million. (See table below) Because of the reduced subsidies, SCUs are even more compelled to increase tuition and other fees.In UP, tuition increases have been imposed even under the Socialized Tuition and Financial Assistance Program (STFAP). While in 1989, tuition was pegged at P17 per unit today it stands at P300 per unit. In 2001, tuition in the UP graduate school increased from P300 per unit to P500-P700 per unit. In the state university’s five units, laboratory fees have also been jacked up. From the previous P0.00 to P50, these fees were increased to P500 to P600.Processing fees. Meanwhile, in PUP processing fees were hiked by 67 to 100 percent. The PUP administration also plans to increase tuition from P12 per unit to P88 per unit. The Philippine Normal University (PNU) also increased its tuition by 400 percent in 2003. Regional state universities also suffer tuition and other fee increases. In Central Luzon State University (CLSU), for example, tuition and miscellaneous fees were hiked by 298 percent. At the Aklan Polytechnic Institute, tuition will increase by 400 percent in the next four years. The Ramon Magsaysay Technological University (RMTU) in Zambales raised its tuition from P80 to P150 per unit last year. A P200 development fee is also collected from the students. The Mindanao State University in General Santos City will raise its tuition from P50 to P150 per unit. The University of Eastern Philippines (UEP) in Samar will also implement a tuition hike, from P40 per unit to P150 per unit. The budgets cuts have reportedly driven thousands of state scholars from registering at the SCUs anymore because of higher tuition. They either join the increasing army of college dropouts or, particularly those whose families can afford it, enroll for two-year technical or vocational courses in quest of a job abroad. Meanwhile, about 10,000 students from the Mapua Institute of Technology (MIT) in Manila walked out of their classes on Feb. 14. Wearing black, the students opposed the proposal to change the name of the university to Malayan Institute. MIT, a top engineering school, is owned by the Yuchengco Group of Companies. The Yuchengcos own the Malayan Insurance and Rizal Commercial Banking Corporation, among others. The school is listed among the top 1,000 corporations in 2003 with P28.7-million profit. the budget cuts on state universities is so disheartening. these bright minds from the lower classes should be supported more because they're the ones who have experienced social injustice first-hand aNd are likely to want to do something about it. Some are extremely anti - American. I guess they would prefer that the RP be dependant on Russia, China or maybe Bin Ladin. They offer problems with other peoples words but are very shallow with solutions. However they are only here because the Americans saved them and the RP, as history and professional historians have writen. Those anti-Americans RPs are also educated as they are because the Americans brought education to us in the RP. People can see a person for what he is no matter how he writes or tries to impress or tries to gain attention. It is not unusual that people try to blame others for their (the people) shortcomings. They should look at themselves and find out why they are not doing things properly and it usually that they spend time trying to blame America rather than to try to solve their own inefficiencies. Thanks for your two responses. I have addressed your kind of response sometime ago. Here, check this out. The illiteracy (and consequent ignorance) of the native majority is the main reason why our homeland is in perpetual socioeconomic and political predicament, from the time the Magellan discovered the islands for the western world (Europe at the time) to the present. As long as the native Malay majority are kept ignorant, no necessary radical changes to improve their lot can occur; and that is what the ruling class - foreigners and their native partners- want to keep and maintain. Re: Western thought for example,in terms of classical Roman or Greek republicanism or the Enlightenment is not bad for it demands integrity and virtue in public life/service (government)/ All these we learn in so-called liberal education. Unfortunately, even such an education does not guarantee unselfish public service as we have seen quite frequently in our homeland's leadership, local or national. But at the same time, education has turned out a few dedicated pro-poor and nationalistic ones in recent decades or years, i.e. late Senator Jose Diokno, Haydee Yorac, Ed Jopson, the late Capt. Rene Jarque, Haydee Yorac,etc. The issue now is how can the majority get a true education that allows them to learn/think critically and thus engage in social criticism, a sine qua non in a true democracy. Looks like the majority are in a cage that needs to be destroyed.